In the best of economic times, an implicit arrogance defines high-end clothing stores. Whether they furnish their stores elegantly or chicly, they challenge all who enter to aspire to equality with the fine goods on display. When the economy goes belly-up, however, very quickly the attitude and hauteur, the postures and pretenses, of even the most established enterprises come to seem hollow and foolish. How much truer that is for stores that are just opening, like the new Diesel flagship at 685 Fifth Avenue, on the southeast corner of 54th Street. The knowing airs and calculated hipness that might have seemed enviably sharp only six months ago feel suddenly and thoroughly beside the point. The irony is that the look of the place is decidedly downtown, with faux rusted metal walls along the interior, textured to look as distressed as the jeans and leather jackets on display. But no one is fooled, of course: the wares are dependably expensive, even as they invoke a hardscrabble world that is closer to reality today than was ever imagined when Diesel signed its lease all those months ago. 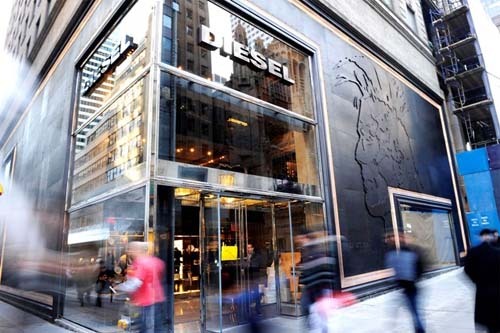 Like most of the brand-name Flagship Stores Along Fifth Avenue, the new Diesel outlet does not exhibit the slightest respect for the ornate pre-war building it inhabits. It hugs the street corner with a facade of dense black metal, trimmed with lights, that recalls the Kabaa in the city of Mecca. An important distinction: cut into the metal is the silhouetted head of a hipster with a Mohawk. As you step inside, you come upon an impressive three-story atrium that rises above you, and a mesh of metal flooring at your feet. Though an old leather couch — or one designed to look old — invites you to sit, most visitors proceed to the sales area, where the metal floor yields to the sort of burnished bare concrete that embodies the Diesel aesthetic. Along some of the walls near the entrance, there is fake masonry that seems out of place with the look that the designers sought. After passing through the entrance you come upon a tangled warren of darkened spaces that rise up through three largely indistinguishable floors. One reaches them by elevators whose walls are silk-screened with images of abandoned computer parts or by stairways whose steps are laced with light. Though not strictly speaking an architectural detail, rock music blares so loudly and pervasively through the establishment that it becomes the defining feature of the place, creating a claustrophobic intensity that rivals the nearby Abercrombie & Fitch flagship, at 720 Fifth Avenue.